While it may be difficult to predict impacts, we can–and must–take action. Growing uncertainty means preparation is even more urgent. To meet future challenges, we need adaptable urban flood management today. Most flood management actions tend to be large, costly investments that have lasting consequences for society, such as the construction of enormous dams and dredging of drainage channels. Additionally, flood management plans are typically crafted to operate within a narrow range of conditions. This traditional approach to flood management – based on the assumption of a more-or-less stationary climate – is quickly losing ground. We need robust and flexible measures to deal with urban floods. Coupled with the dynamic nature of cities and societies, climate uncertainties complicate flood management decisions. The best way to deal with uncertainty is to master the art of flexibility — developing measures and flood defenses that can evolve over time — to prepare for a wide range of plausible outcomes from the start. Several approaches and tools have emerged in recent years to better support decision-making under conditions of deep uncertainty. One such approach is the Dynamic Adaptive Policy Pathways (DAPP) approach, which supports the development of an urban flood management plan that can deal with conditions of deep uncertainty. 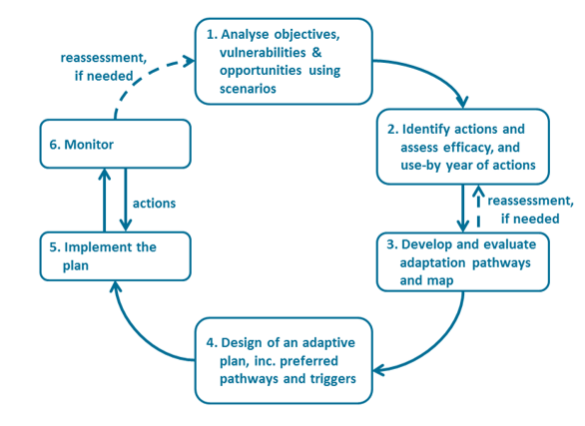 What is an ‘adaptive pathway approach’? Mapping possible ‘pathways’ allows users to plan a journey towards sustainable urban flood management by exploring multiple routes alongside each other, all while considering costs and consequences. Each adaptation pathway consists of a series of actions. If circumstances change along the way, you can change your route by switching or adding actions so that you ultimately achieve your goal. Pathways differ according to the actions involved, their resulting benefits, and the required investments. Some pathways are more robust, while others are flexible. The ultimate choice depends on the stakeholder preference and the resources available. The different options have one thing in common: Each pathway results in an urban flood management strategy that is effective at any point in time between now and the distant future. This approach allows us to plan without running the risk of regret of doing too little too late or too much too early. Figure 1 illustrates the different steps in the DAPP approach. How has this approach been applied? The Netherlands Delta Program is a good example of how the Dutch adopted an adaptive approach towards flood management. They shifted from a basic ‘predict and act’ system to one that involves anticipating the future and adapting as circumstances change. Figure 2 shows the adaptive pathway map that has been developed for the city of Rotterdam in order to identify the best flood management actions to pursue at different time stages. Managing flood risk in Thames Estuary, UK – In the UK, the use of adaptation pathways was pioneered by the Thames Estuary 2100 (TE2100) project which produced a plan for managing tidal flood risk in the Thames estuary and London. 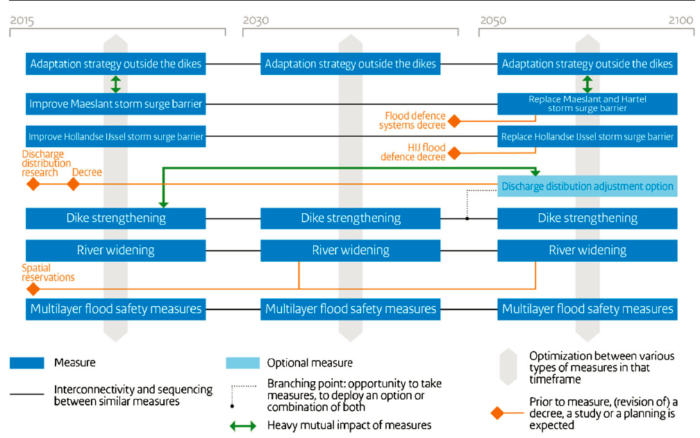 The TE2100 plan has a set of options for adaptation pathways (see Figure 3) that can cope with increases in maximum water levels up to a worst-case scenario by 2100. 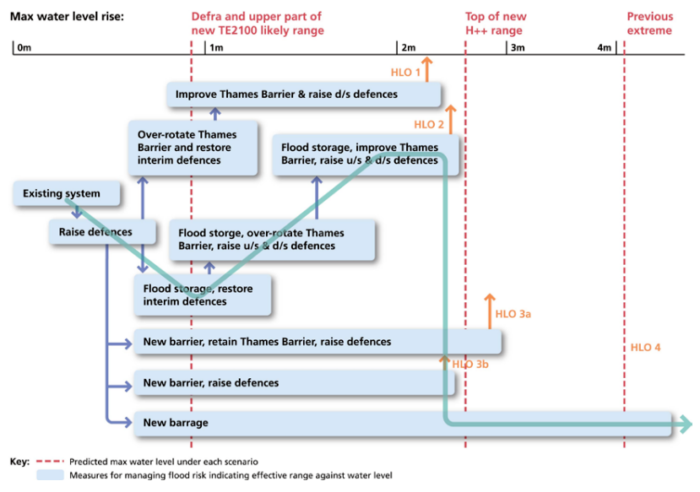 The preferred pathway identified is structured as a staged long-term modification of the Thames Barrier combined with local measures to manage fluvial and pluvial flooding – including making space for water, local flood defenses, building resilience measures, flood forecasting, and emergency planning. TE2100 sets a long-term strategic vision for how London can adapt, and establishes the need for transformational change in the long term. Figure 3: Adaptation pathway map for the Thames Estuary – shows the high-level adaptation options and pathways developed by TE2100 (y-axis) relative to threshold level increase in extreme water level (x-axis). The light blue line illustrates a possible ‘route’ where a decision maker would initially follow HLO2, then switch to HLO4 if sea level were to increase faster than predicted. Curious to learn to use the DAPP approach and Adaptation Pathway Mapping tool? Join the 2018 Understanding Risk Forum technical session: Assessing Urban Flood Risk: Going with the Flow. In this session, we will facilitate dynamic discussions and interactive activities to show how this approach works and demonstrate its applicability in different cities. Come and join us on the journey toward sustainable urban flood management! Acknowledgements: ‘Go with the flow – An adaptive approach to managing flood risk’ technical session is jointly organized by the Urban Flood Community of Practice (UFCOP) and NUSDeltares.